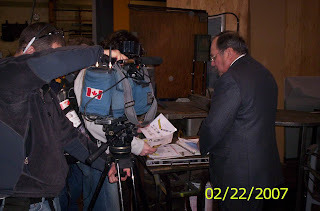 BCTV news with Peter Grainger's coverage of the Goldenhawk Streamliner project filmed Thursday 22 February at AGGRESSIVE TUBE BENDING in Port Kells will air tonight on the 6 O'Clock news. Look for it in snips during the news and the spot will be at approx. 6:47pm. 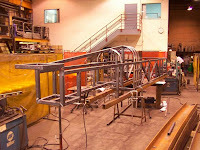 17 February 2007 A special day for the Goldenhawk team that started work at Aggressive Tube Bending at 7 am to trim and install the final body mounts on the top and bottom of the chassis. 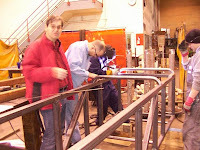 Today was Adrian's birthday and yet he was hard at it on the shop floor along with Yuri, Andrey,Peter,Pat and Werner. They were joined by a new craftsman, Ben Dixon also an employee at ATB, Dan our sponsor from Vacuums Plus was there until he had to go to open his store. Collen McKenzie came by to check out the progress and Brian Beesley is recovering from his accident in Grants Pass Ore. and should be home soon, we all wish for his speedy recovery. 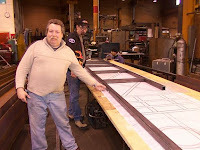 Ross, Werner's friend came by to check out what his people need to do with the fabrication of the sheet metal for the cockpit,engine bay, tanks (fuel,water/oil) plus the structural inside of the nose cone. he will select the right people for the job and set a meeting to discuss the plans. Peter noted that it was one year ago today that I emailed him to ask if he would assist us in the project. 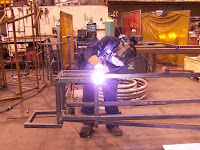 Well one year later he and his partners and the crew at Aggressive have nearly completed the chassis. I can't express how pleased and honoured I am to know these guys and to have them lend their time and resources to the project. Not to mention all the shop crew who work on the car in spare time and do it with care and a professional skill. On the horizon is the possibility that a group called The Film Crew will be joining the team to film the project for the documentary. Thanks again everyone for your devotion to the cause to cure SALT FEVER! 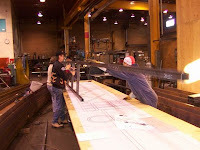 The guys in the shop were welding the first side together and the second side was laid up and tacked. As we talked with Peter Diesing about the progress Saturday would bring, Ehsan was already fitting the nose end cross piece. Man if they don't slow down there will be nothing left for Saturday but bench racing and coffee break. This sponsor is making race car building look like child's play. I guess that's the difference between back yard building and professionals fabricating. I think many of us have sweat-ed out the trials of home shop hot rodding and loved it but sometimes it's just nice when it all comes together smoothly. Thanks guys. Well this has been an eventful day, what I call Day 3 (about day 1653 for me). First a meeting with Ross at Cummins to find the correct engine mounts. They will be ready by Friday. The engine shop is swamped with $250m engine builds so we won't get the race engines this month but we are assured they will get built on time. While we were there we checked out some of the adwear, nice selection. 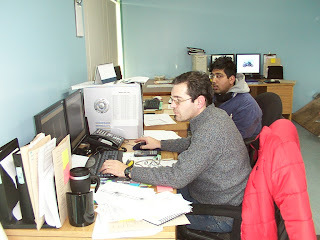 Kevin delivered the updated drawings for the axle to Aggressive and Ehsan, Adrian and Shaun were working on the computers when Werner and I arrived. 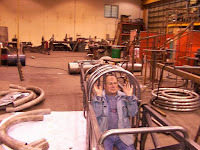 Well today was exciting as the crew at Aggressive Tube Bending, under the watchful eye of Yuri started to cut the steel and assemble the chassis. 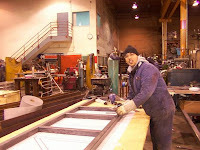 Kevin Knox attended to work out some last minute changes and he will update the drawings for tomorrows shift. There seems to be a huge amount of blank white space here...between this and the previous posting. I guess it resulted from my trying to move pictures around and editing the text, etc. 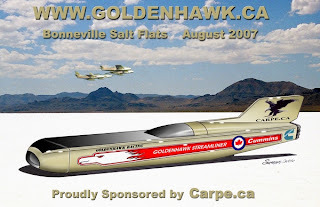 With Daryle's artwork, and some Photoshop magic, we put together some sponsors posters to help promote the Goldenhawk Project here at home. The one shown here is sponsored by Carpe.ca, the world's fastest bailiff! 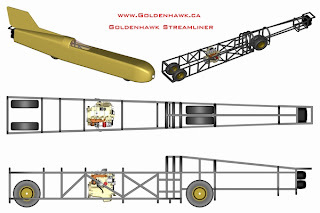 Randy Pierce and Daryle Sorenson discuss design and concepts for the Goldenhawk Streamliner. At this stage, it really IS a dream! 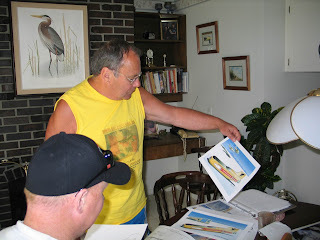 This picture was taken late summer 2006, as we all discussed the next steps. This blog is being started in Feb 2007, so please bear with us as we try to recapture the past few months in both text and photos. In the past two months, the project has taken off, like the jets that it's named after, so I'm going to have to race to catch up! There's lots of photos coming and the Streamliner is becoming a reality now.